Next up for the 27-year-old Kei Nishikori is another 20-year-old in German fifth seed Alexander Zverev, who had too much in his arsenal for Russian Daniil Medvedev and won their quarter-final 6-2 6-4 in less than an hour. 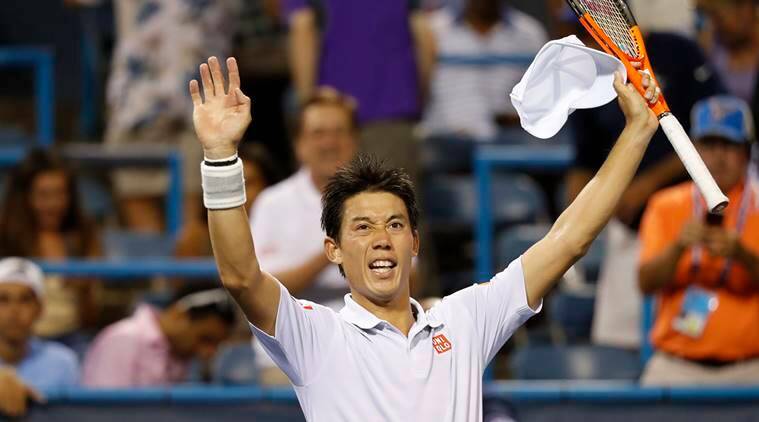 Second seed Kei Nishikori shrugged off fatigue and saved three match points before beating unheralded American Tommy Paul 3-6 7-6(8) 6-4 in their Citi Open quarter-final on Friday. The world number nine seemed destined for an early exit in the fierce Washington heat when 20-year-old Paul brought up match point at 5-3 in the second set with a backhand winner down the line. Nishikori survived with an audacious drop shot from the base line that Paul could not run down, however, before staving off two more match points in the tiebreak and taking the second set. That appeared to break the spirit of the 225th-ranked Paul and Nishikori, who had post-midnight finishes to his previous two matches at the tournament, took control in the final set to advance to Saturday’s semi-finals. Next up for the 27-year-old Japanese is another 20-year-old in German fifth seed Alexander Zverev, who had too much in his arsenal for Russian Daniil Medvedev and won their quarter-final 6-2 6-4 in less than an hour. “I felt good from the start to the end. It was a great match for me,” world number eight Zverev told Tennis Channel. “I knew I had to take his time away, play my aggressive game and dominate as much as I could and it worked out very well today. The other semi-final will pit American Jack Sock against South African Kevin Anderson in a battle of the big servers. Sock won his quarter-final against Canadian third seed Milos Raonic 7-5 6-4, while Anderson came through a second three-setter in the space of 18 hours with a 6-4 4-6 6-3 victory over Yuki Bhambri of India. “It was a really tough match tonight. Conditions were hot, it was a little gusty, balls were flying,” said Anderson, who did not get to bed until after 2 a.m. local time following his late night victory over top seed Dominic Thiem on Thursday. In women’s action, top seed Simona Halep wilted in the afternoon heat and retired with fatigue at 2-6 6-3 1-0 down in her clash with Russian Ekaterina Makarova, who will play Oceane Dodin of France for a place in the final. The other women’s semi-final will be an all-German affair with fourth seed Julia Goerges taking on unseeded compatriot Andrea Petkovic in an all German affair.